Discovery Square is a nice exception to that trend. 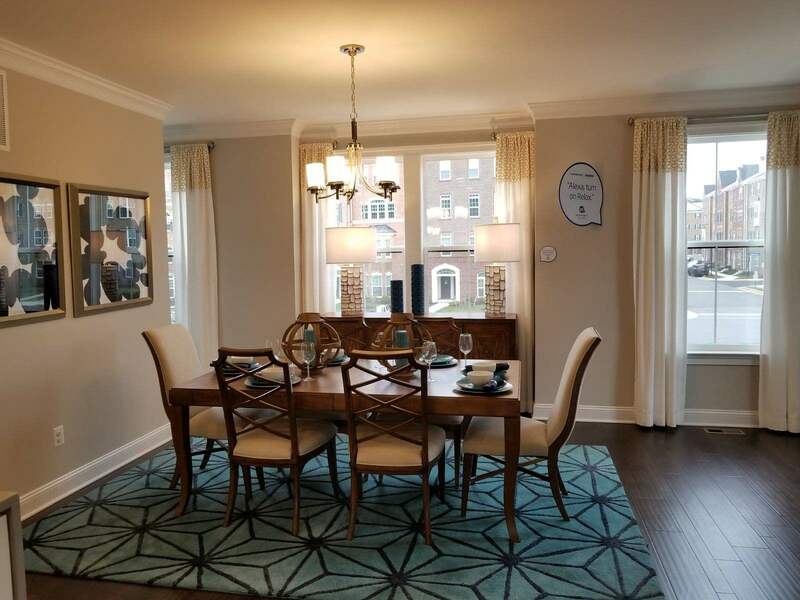 Situated in Oak Hill, Virginia, right off of Rte 28 between Herndon and Chantilly, Discovery Square offers some large 2 car garage townhomes in two different models. Square footage starts at 2600 sq feet and can go as high as 3200 sq ft.
Lennar, the home builder, did a great job with utilizing the smaller community footprint by “GOING VERTICAL”! Each townhome is four levels and all have rooftop terraces with an optional dual side fireplace. You have the option of selecting either a rear loading or front loading garage. The heart of the home is the kitchen and Lennar placed the kitchen right in the middle for easy access to living spaces (dining room and family room) on either side. I appreciate the fact that you have the option for bathrooms on each level. This allows you to easily entertain guests on all 4 levels. The location is close to everything! Work at the NRO? You can WALK to the office! And if you have a teenager like I do, what is not to like about walking to Chick Fil-A? There is also a park expansion going on behind the community and Starbucks, Giant, Lowes is within 1.5 miles. Discovery Square is just 2 miles from the Silver Line metro and minutes to Dulles Airport. As of January 2019, the base pricing is in the low $600s. They do have spec homes too so if you cannot wait for a home to be built but still want all the benefits of new construction give me a call at 703 539-2969 and we can coordinate with the builder to provide you with all the current options.